Switzerland is one of Europe's most beautiful countries. The mighty Alpine peaks dominate the whole country, lending a fairy-tale appearance to even dour cities like Zurich. In the north, away from the mountains, the scenery remains stunning, with rolling green pastures and chocolate box villages. As well as the lure of the mountains, Switzerland's cultural diversity lends a distinct character to its great cities, from French-speaking Geneva to German Bern to Italian Lugano. The German-speaking northeast of Switzerland extends from the wooded hills of Schaffhausen in the north, almost surrounded by Germany, to the wild and beautiful alpine scenery of William Tell country in the south. The city of Zurich is more than just a financial centre, sharing this part of Switzerland with the ancient cities of Zug and Schwyz. Schaffausen straddles the Rhine and has a gem of an old town, famous for its oriel windows and the striking medieval frescoes adorning its ancient houses. 3 kms outside the town are the Rheinfalls, magnificent waterfalls of awe-inspiring power. Visit Stein-am-Rhein, an almost perfectly preserved medieval town about 20 kms east of Schaffausen. Another 20 kms east brings you to the first arm of the Bodensee (Lake Constance), with numerous castles dominating the shoreline. The lake narrows at Konstanz which, although actually in Germany, is worth visiting for its old town. All along the shores of the Bodensee are small resort towns where you can swim and enjoy the watersports surrounded by rolling hills, orchards and meadows. Saint Gallen is an ancient university town with a bustling old town and a famous library. As well as its impressive cathedral the streets of the old town contain thriving shops in beautiful old buildings with picturesque oriel windows. The Walensee is a beautiful calm lake at the foot of the lovely Churfirsten peaks. Together with the Toggenburg valley this area offers wonderful opportunities for winter sports, watersports, and walking amongst stunning scenery. In the far corner of this part of Switzerland is the principality of Lichtenstein, with its pretty villages and excellent mountain walks. 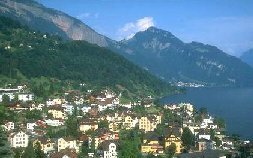 Lake Lucerne, the Vierwaldstattersee, must be one of the most beautiful lakes anywhere, and excellent holiday country in summer or winter. The name means the lake of the four forest cantons, and in this part of Switzerland many of the important events in Swiss history took place. William Tell is commemorated in several spots, notably Altdorf and the Rutli Meadow at the far end of the lake. From here the road ascends to the bleak St Gotthard pass, now bypassed by a tunnel. The lake itself has the pleasant resorts of Weggis, Vitznau and Gersau on the north shore. Behind is the Rigi mountain with lovely meadow walking and a superb view of the Alps across the lake. On the southern shore is the Burgenstock and Beckenried, again with good walking among wonderful scenery. All these resorts are served by steamers based in Luzern which criss-cross the lake and connect efficiently with cable cars and funicular railways. Take the cable cars to the summit of Mount Pilatus with marvellous views of the Alps and Lake Lucerne, or venture deeper into the mountains to the summit of Mount Titlis with its amazing revolving cable car. Below is the ski area of Obermatt, centred on Engleberg. Contrary to expectations, Zurich is a very attractive city, with a jumble of buildings set in the twisting alleys of its old town, and a distant panorama of snowy peaks beyond Lake Zurich. The town has its share of museums and fine buildings, and the main shopping street, Bahnhofstrasse, testifies to Zurich's wealth. Plenty of nightlife on the right bank of the river, and relaxing walks along the lakeside promenades. Zug, about 30 kms south of Zurich, has its own attractive lakeside and a small but interesting old town. Further south again is the historic town of Schwyz, which gave Switzerland its name, with many grand old houses and its Bundesbriefmuseum.